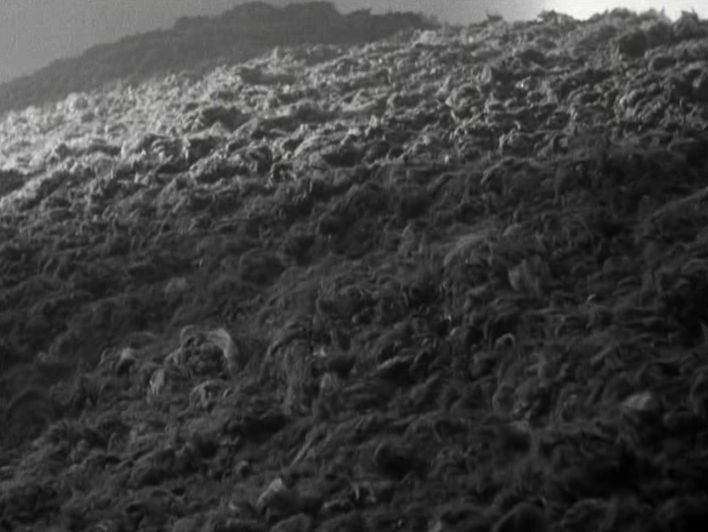 Alain Resnais’s Night and Fog (Nuit et Brouillard, 1955) is a 31-minute film about the Nazi concentration camps that has been called the greatest documentary film every made (indeed, Francois Truffaut called it simply the greatest film ever made ). 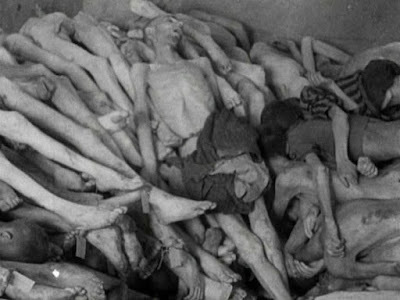 Certainly the idea of making a film about such a horror must have been a daunting prospect to a person of Resnais’s integrity, and when he was initially offered the opportunity to make this film, he declined on the grounds that he did not have the experiences to authentically engage with this subject . He changed his mind when the poet, novelist, and essayist, Jean Cayrol, who himself had been a concentration camp survivor, was brought in as a script collaborator. Cayrol’s most famous work, in fact, was his collection of poetry, Poèmes de la Nuit et du Brouillard (1946), concerning his sufferings in the notorious Mauthausen concentration camp . Interestingly, a few years later Resnais would have similar misgivings when invited to make a film about the Hiroshima nuclear holocaust. But he changed his mind on that occasion, too, by making something quite different. For that project he shifted his narrative to a differnt, more personal, level, and crafted another masterpiece in Hiroshima Mon Amour (1959). For the case here of Night and Fog, Resnais and Cayrol managed to come up with something that, in the space of half an hour, did bring about a meaningful presentation about the general topic at hand – the concentration camps. This was done not by minute documentation of all the horrific details, but instead by providing a meditation into the very problem of trying to grasp just what happened back there in time. This problem of trying to construct and hold on to meaningful memories of the past is something that has been a general focus of Resnais’s work and was addressed in virtually all of his movies. Resnais had the key insight that our memories constitute an essential aspect of how we deal with time, itself. One could say that our very notions of time, and ultimately of our selves, are intimately linked with our memorial representations. I have discussed in past reviews how we fundamentally understand ourselves, as temporal agents, in terms of narratives , and this perspective harmonizes with Resnais’s presentations in his works. The narratives that we construct about ourselves represent how we see ourselves. And the narratives we construct about past historical events similarly represent how we culturally view those historical events. Naturally, these two perspectives – our personal views about ourselves and our views about the social world around us – are closely linked. So then what kind of meaningful understanding can be developed concerning the Nazi concentration camps? The numbers on this subject are mind-numbing. 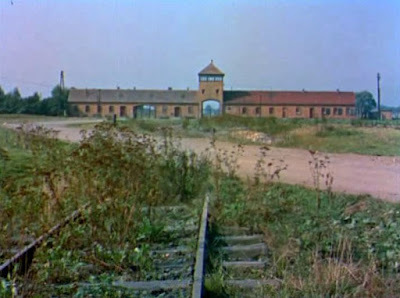 Over the course of the Nazi regime (1933-45), there were thousands (the precise number is disputed, depending on the definition of camps and sub-camps) of concentration camps constructed and millions of people imprisoned in them . Perhaps four million of those imprisoned, more than half of the prisoners, did not survive. A heavily disproportionate number of the victims were Jewish: at the end of the war, only about 21,000 of the original 600,000 Jews were left in Germany . But statistical and documented accounts like these  are difficult to get a feeling for; and Resnais wanted to pursue a different path toward understanding. Night and Fog puts the viewer into the mind-frame of someone actively trying to track down what was the reality of the camps. We start off in the “present” (i.e. 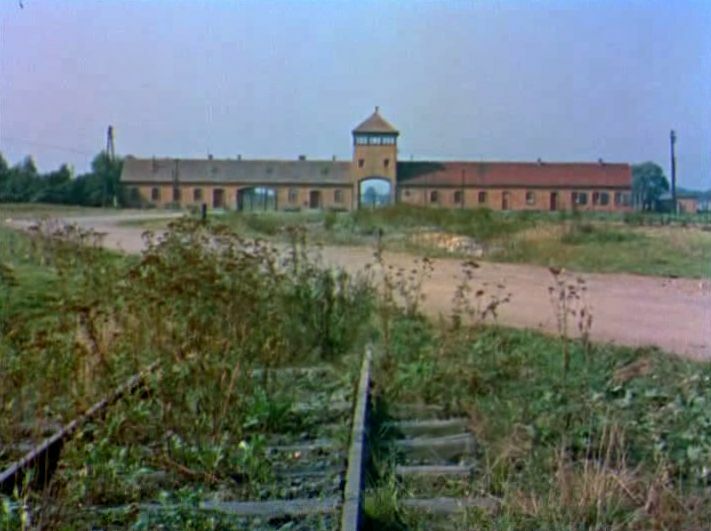 1955) with color footage showing the empty and grass-overgrown grounds of some former concentration camps. The camera moves incessantly as if searching for something. The tone of the narration is dispassionate, like an objective investigator. We can speculate that the subdued tone perhaps comes from a person like Cayrol who had experienced some of the horrors and is trying to approach the subject with some wounded trepidation. In any case, the detached tone of the narrator is crucial and more effective than typical emotive narrations about past avoidable human tragedies, such as the US-Academy-Award-nominated To Die in Madrid (1963), which was narrated by John Gielgud and Irene Worth in very emotional tones. Here in Night and Fog the dry narration and the distancing, almost frosty, music by Hanns Eisler put the viewer into almost a dream state to contemplate the unimaginable. In those opening color shots of the empty countryside, the narration remarks that even following a pastoral country road can lead one to a concentration camp – just as the camera then pans over to a barbed-wire fence that encloses one such now-empty camp. 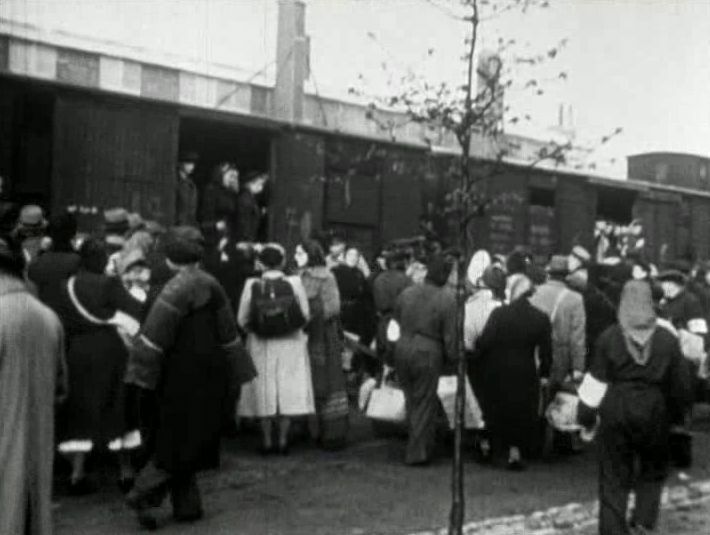 Then the images shift to black-and-white footage documenting the early activities and decrees in 1933 that initiated the camps. The film will proceed in this way, shifting back and forth at least twelve times between the color-signified “present” reflective mode and the black-and-white-signified documentary footage of the past. The durations of the color sequences are actually quite short, but they always feature the prowling, searching camera movement that helps maintain the vitality and pace of the narration. 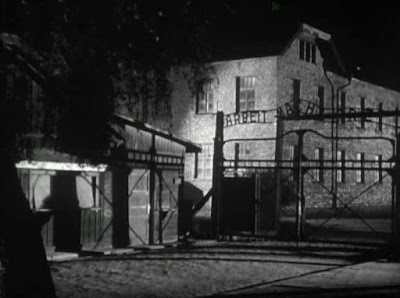 Early on, the black-and-white footage shows the constructions and designs of the concentration camp buildings, where were relatively ordinary and mundane. 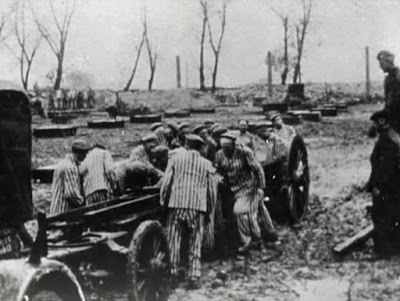 Then images are shown of the massive round-up activities, as the Nazis gathered the many ordinary people to populate these concentration camps. In the early stages the prisoners were not specifically targeted to be Jewish. The Nazis just wanted to imprison those they deemed to be troublemakers – activists, Communists, socialists, slackers, etc. But after Himmler took over the overall management, they specifically went after “racially undesirable elements”, such as Jews, Romani, homosexuals, and people deemed to be criminals. Associated with this was the 1941 “Nacht und Nebel” (which means “Night and Fog” in German) decree, which targeted anyone thought likely to support the resistance. 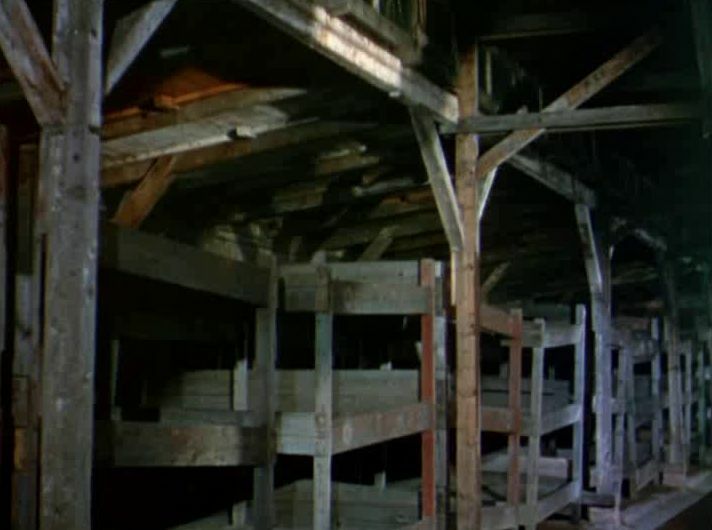 Again, in color, the narrator struggles to uncover what really happened in those quarters that looked like ordinary blockhouses. The explorations of the abandoned camp grounds takes the viewer over to some curious buildings: a hospital, even a prison. The hospitals were often used for experimental amputations, as if the prisoners were laboratory rats. Similarly, major drug companies tested the effects of danerous drugs on prisoners. The prisons were closed quarters where even more unspeakable torture could be inflicted on those who disobeyed. 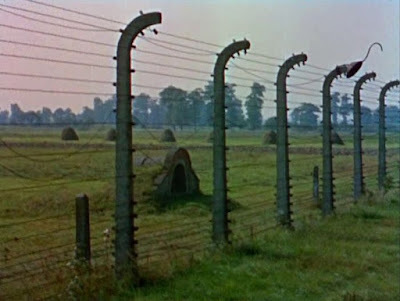 Later, some of the camps were turned into extermination camps, specifically designed to kill its short-term visitors. 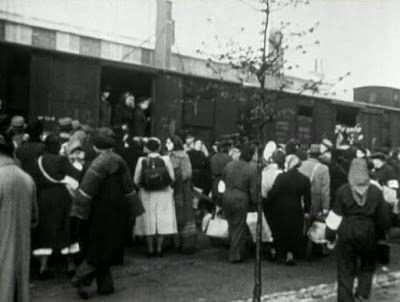 When new inmates arrived at such camps in boxcars, they were immediately separated: “workers” were instructed to go to the left, while those ordered to the right were destined for immediate execution. The Nazi overseers of the camps strove for efficiency and found that Zyklon B cyanide-based pesticide was particularly effective as a lethal instrument. And nothing in the execution camps was wasted. We see images showing mountains of women’s hair that was used to make clothing material and rugs. Human bones were used to make fertilizer. 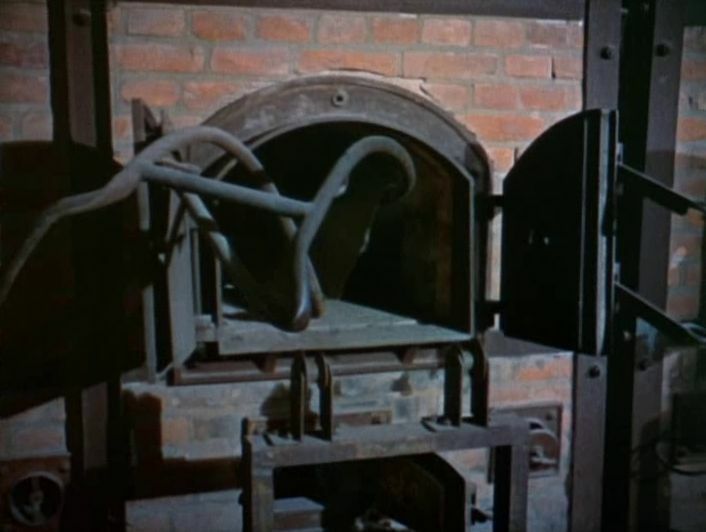 And “with the bodies they tried to make soap.” Here we see humans being treated like animals. But in fact we don’t even have to treat animals this way, and we shouldn’t. I will return to this point. At the end of Night and Fog, there is the question asked as to who is responsible. Here was a concern expressed by Resnais and Cayrol just ten years after the concentration camps were exposed to the world that, as memory fades, people might lose track of what happened there and consider that to have been just one never-to-be-repeated anomaly. Now sixty years further on, the concern should be even greater, because those events have faded even further and are even more abstract in the popular consciousness. What can we do to hold on to what happened there and help us see how those past events relate to what is going on around us today? That is what you feel as the film comes to an end. To me this film highlighted two things worth considering in this respect. When we see those steps leading to the Mauthausen quarry, it is not evident from the architecture that 3,000 Spaniards died in the construction of those steps. We have to be told that, and it is best that we are told within the structure of a narrative. Night and Fog provides that narrative. The “method of loci” (aka “memory palace”) is a memorization technique that combines architecture and narrative. It consists of an imaginary journey (i.e. a narrative) through a remembered architecture (the “palace”), during which individual memories are stored in different palace locations. Since our memories work through the construction and exploration of narrative structure, the method of loci offers up a customized narrative that one can use to store memories. Resnais has done that for us in Night and Fog. He presents a prowling narrator who (in color) wanders among the camp ruins and evokes images (in black and white) that fit into this memory-palace journey. By seeing (and re-seeing) this film, we get a better feeling of what happened there. Moreover, there are also social issues in this regard that are equally important. When animals are raised and then sent to the slaughterhouse, they are viewed as objects whose only value is the extent to which they contribute to our material utility. We eat their meat and use their hair and skin to make clothing. We close our eyes to the fact that animals are sentient beings who can anticipate and suffer. When we heartlessly treat animals as senseless “things”, we close ourselves off from our own native capacities for compassion. Apart from the inhumanity of treating animals this way, there is a further damaging side effect – the transition from treating animals that way to treating humans that way is not such a big step. That is where the problem gets worse. It would be better for everyone if we moved our society in the direction of universal compassion – so that treating any animals, including humans, that way is held to be unthinkable. When I watched Night and Fog, I felt I was exploring animal slaughterhouses for humans, and it made me think of animal slaughterhouses, generally, as well. Maybe you will get that feeling, too, when you watch the film (it is freely available). Phillip Lopate, “Night and Fog”, The Criterion Collection, (23 June 2003). James Leahy, “Nuit et Brouillard”, Senses of Cinema, (May 2003). Cayrol would go on to write the screenplay for Resnais’s Muriel (1963), which was also concerned efforts to fashion and hold on to memories about a disturbing past, in this case the Algerian War. “Memento” (2000), The Film Sufi, (1 April 2013). “Blow-up” (1966)，The Film Sufi, (14 August 2014). “The Passenger” (1975)，The Film Sufi, (15 November 2014). “Nazi Camps”, Holocaust Encyclopedia, (20 June 2014), United States Holocaust Memorial Museum, Washington, DC, USA. Roger Cohen, “Europe’s Deepest Debt”, International New York Times, (10 August 2015). Richard J. Evans, “The Anatomy of Hell”, The New York Review of Books, (9 July 2015). “Eating, 3rd Edition” (2009), The Film Sufi, (19 September 2010). "Earthlings" (2005), The Film Sufi, (14 February 2011). “Forks Over Knives” (2011), The Film Sufi, (16 November 2012). absolutely love your take on Night and Fog. I definitely need to watch this..